Word of Mowf | Music | Style Weekly - Richmond, VA local news, arts, and events. The domestic evolution of a DJ. 1. Oneness of Juju, "African Rhythms" LP (Black Fire, 1975) Classic record from Richmond native Plunky Branch — my father-in-Law — who I sampled to create his new hit, "Drop." 2. The Whole Darn Family, "Seven Minutes of Funk" 12-inch (Soul International, 1976) A hometown classic sampled by everyone from Grandmaster Flash to Jay-Z. 3. Southern Energy Ensemble, "Energy" (Black Fire, 1975) This Virginia State University collective included my Dad. I have sampled various cuts from this. 4. Trussel, "Bicentennial Boogie" (Bridge the Gap, 1976) A Petersburg group that included my mentor, Bill McGee. The first 45 I ever owned. 5. Sly & the Family Stone, "Sing a Simple Song" 45 (Epic, 1969) The first record I ever sampled. 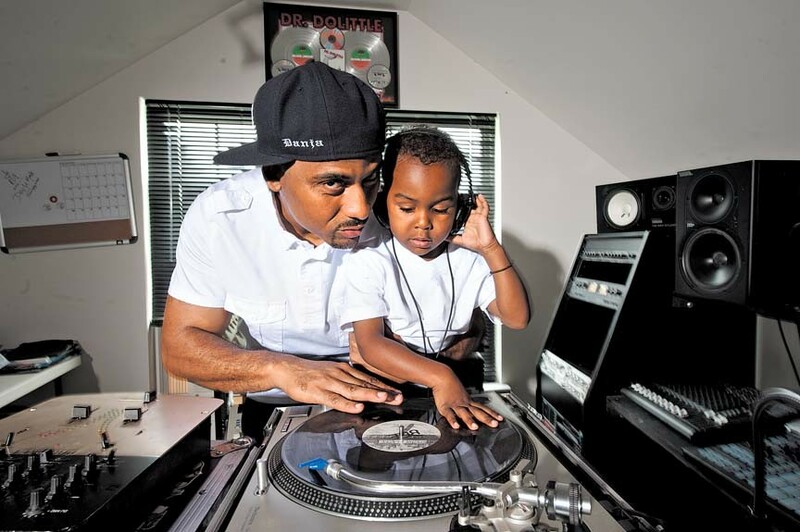 At home, DJ Danja Mowf and his son Jordan do a little father-and-son beat matching. "I was told to find something I love to do and get paid for it." It's just after 11:30 p.m. Friday, and Danja Mowf is DJing from a booth at Vision Ultra Lounge in Shockoe Bottom. "We're just getting warmed up," he says. "Get some drinks!" This is, to be frank, typical club banter set to typical club hits — Beyoncé, some vintage LL Cool J — because well, this is what people like. And while Danja is certainly having fun, he's not here merely because he loves it. This is work. This is his job. "I do this while my kids are sleeping," he says. Some Fridays he's here, others at Have a Nice Day Cafe or a private event. Of course, Shockoe's reputation has suffered some blows in recent months, and Danja, a married father of three, doesn't live in a vacuum. "I pay attention," he says. "I don't do anything dumb. If I'm not being paid to be out, I'm not." Indeed, business is something Danja — born Adolphus Maples III — has honed over the years. As a rapper, DJ and producer in a '90s Richmond collective called SupaFriendz that once scored a Billboard chart hit, Danja Mowf saw the corporate machine firsthand. He turned away, deciding to stay in Richmond and work for himself. Likely enough, revelers have come here tonight because they know he's DJing. Or heard his voice on urban radio, advising them to come. Or saw a flyer he designed. Few people underneath him, however, know his Richmond presence is just one part of the Danja empire. By day, Danja does design, production and commercial work for seriously big clients as part of his company, Maples Media Group. His work appears in trailers for the Fox show "24," the video game "The Simms" and an HBO boxing movie. Chiquita, the banana company, recently tapped him to create a jingle. His music appears in the 2011 Disney movie "Mars Needs Moms." "It's cool I get paid to spin records," he says. "But as you get older, it's got to make more sense. I was told to find something I love to do and get paid for it. I don't have to be Danja Mowf the emcee or producer — as an artist, I can get paid to produce or perform for a movie trailer. It's something I love to do." A John Kennedy High School graduate, he was exposed to music early — his father played funk in bands around the city. By high school, he took up trumpet. A school music teacher turned out to be his dad's former bandmate, starting a bond that's easiest to think of as a Karate Kid-Mr. Miyagi relationship, except with African-American music instead of karate. Bill McGee, who stressed economic self-reliance, created talent shows that nurtured Richmond greats including D'Angelo and rapper Skillz. "He taught me to make music but he didn't do it for me," Danja says. Fast-forwarding lots, Danja had, by the mid- to late-'90s, worked with Skillz, DJ Lonnie B and Mike Street, who gigged at the University of Richmond radio station, WDCE. SupaFriendz formed a label and in 1996 released "Vowel Movement." In 1997, Danja Mowf released a solo album and in 1999, they got their Big Break. After hijacking Timbaland and Aaliyah's "Are You That Somebody" and rapping over it, their song leaked. In short the song won all kinds of fanfare, including a Grammy for Aaliyah. It was historic, in a way. "We did one of the first unofficial remixes ever," he says. They got platinum plaques; important people took notice. One day, at 3 a.m., Missy Elliot called to sign him to her label while getting off a jet with Jay-Z and DJ Clue. But, he says, "he saw the politics and drama of record industry" and turned his ambitions elsewhere. He asked for nice recording equipment in lieu of overdue fees and lingering ties. With that equipment, he learned to produce and create the scores, commercials and soundtracks he turns out now. He works from his house. He's there when his three sons come home from school. He returned to DJing around 2004 because it was so much easier than it used to be: No longer does even a serious, purist DJ need to tote dozens of record crates — he or she can just bring a laptop. "It became another way to make money," he says. "I had a name people knew, and all I needed was a computer and a hard drive." "Danja is a one-man show," says celebrated Richmond DJ Lonnie B. The two no longer work together but are godfather to each others' children. "I know a lot of rappers and DJs," Lonnie B says, "and creatively I'd put Danja against anyone. He's a perfectionist, but he has his life balance down, which I admire." The floor at Vision Ultra Lounge is getting packed: more banter, more songs people like, more drinks. You can tell Danja Mouf connects because the floor stays full. "To be a good DJ, you have to read the crowd, build your night," he says. "I'm trying to set up something combustible." He'll be doing that until 2 a.m. And, a little more than five hours later, he'll begin his next, most important job: Dad. For information on Danja Mowf, contact maplesmediagroup.com or follow him on Twitter @DanjaMowf.